If you think Craigslist is creepy and eBay seems like a hassle, there’s a third option for turning your belongings into cash. 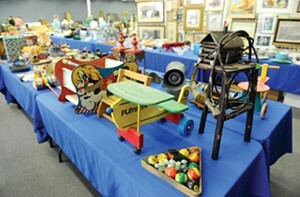 Cannon’s Auctions is a family-owned business that auctions Richmonders’ stuff weekly on its website, cannonsauctions.com. You drop off your stuff at the West End storefront, where Cannon’s staff photographs it, puts it online and sends you a check, minus commission. Recent sales include a Ping-Pong table ($160), an antelope skull ($21.51) and an antique brass car horn ($14). You could strike gold — or watch your grandmother’s favorite figurines go for a dollar.